When Connie Mack left his hometown of East Brookfield, Mass., to embark on a baseball career, his journey began in Connecticut. The journey would take Cornelius Alexander Mack, born Cornelius Alexander McGillicuddy, to the Hall of Fame. He won five World Series and nine American League pennants with the Philadelphia Athletics and earned a plaque in Cooperstown in 1937, the same year as Nap Lajoie, John McGraw, Tris Speaker, George Wright and Cy Young. Nobody has approached his managerial record of 53 seasons. 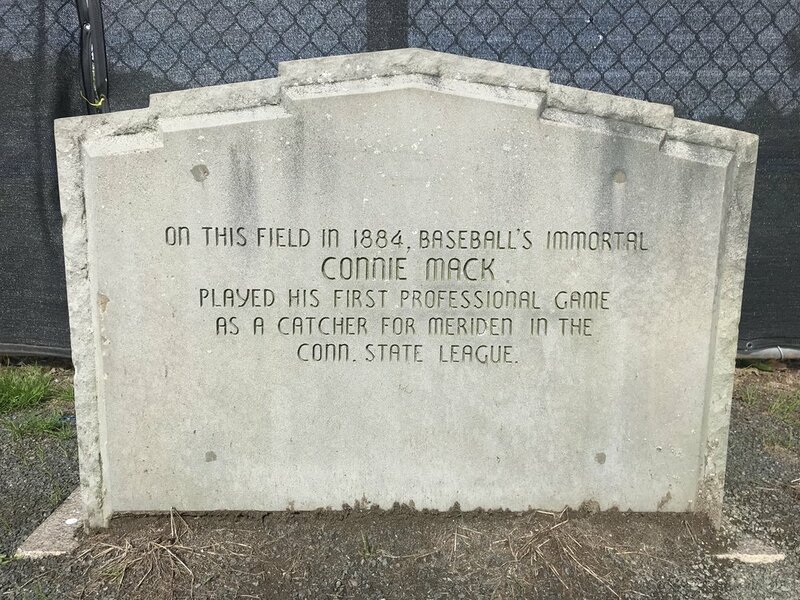 Mack’s first baseball stop was Meriden in 1884. He caught for a semi-pro team in the Connecticut State League for $90 a month and was so beloved by fans that he was presented with a gold watch at the end of the season. In 1885, he joined Hartford of the merged Connecticut State League and Southern New England League. He played two seasons in Hartford as the team became a member of the Eastern League. Mack hit .251 for Hartford in 1886. Teaming with pitcher Frank Gilmore to form the “bone battery” — both were tall and lanky — Mack, 6 feet 1, 150 pounds, was known for his defense. But when the Washington Nationals attempted to sign Gilmore at the end of the 1886 season, the pitcher insisted they also sign Mack. So they did. Mack played three seasons in Washington and 11 in the major leagues, including three seasons as the Pirates’ player-manager. He became manager of the Philadelphia Athletics in 1901 and retired after the 1950 season. He won 3,731 games and managed 7,755, both major league records. How was Mack remembered in Hartford? In an August 3, 1930, Courant story about baseball’s early days in the city, former local semipro player and National League umpire John Jackson Brady reminisced about Mack, who had won four World Series titles and would win his fifth in 1930. Brady, who ran the Hartford-based Brady Brothers Bottling Works and was well-known in the city, described Mack’s difficulty throwing to second base during his early years in Connecticut. Brady was a National League umpire in 1887, but he worked the Connecticut circuit when Mack was playing. Mack would return to Hartford with his Athletics for an exhibition game against the Senators. Gilmore was living in Hartford and his health was failing, so Mack arranged the game to raise money for his old teammate. When Gilmore died in 1929, Mack sent $500 to his widow. In 1940, Mack returned to Meriden for a celebration to commemorate the anniversary of his first season. He also came to New Haven to receive a Gold Key from the Connecticut Sportswriters Alliance in 1940. Hartford Courant excerpt from 1885. Hartford Courant excerpt from 1906. 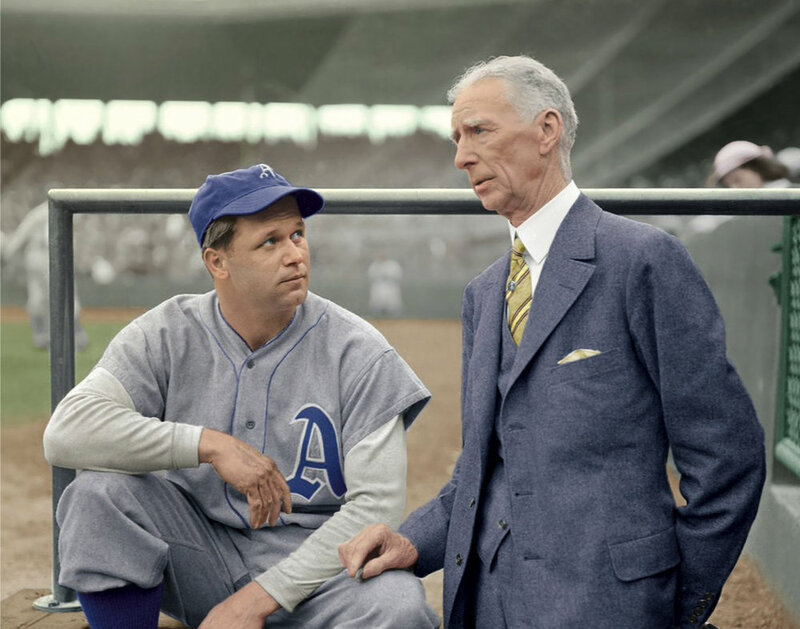 Manager of the Philadelphia Athletics, Connie Mack, and Hartford business owner and baseball proprietor, William J. Tracy in 1911 at the New York Baseball Grounds. Connie Mack (left) managing his Philadelphia Athletics, 1914. Monument to Connie Mack at Legion Field in Meriden, Connecticut, photographed in 2018. In the summer of 1933 and 1935 the Major League powerhouse Philadelphia Athletics led by their Manager, Connie Mack and a young slugger named Jimmie Foxx visited Hartford to appear in charity baseball games against the Savitt Gems. Bill Savitt, jewelry store entrepreneur, philanthropist and team owner hosted Connie Mack's Athletics in front of thousands of fans at Bulkeley Stadium. The Gems were made up of a few pros including Johnny Roser who played for the Boston Braves in the 1920's and other local amateurs and legends in their own right such as Jigger Farrell and Bob Cronin. James “Jimmie” Emory Foxx, nicknamed "Double X" and "The Beast" played 20 seasons in Major League Baseball for the Philadelphia Athletics, Boston Red Sox, Chicago Cubs, and Philadelphia Phillies. In the 1933 season, Foxx was leading the home run race for in the Majors and was coming off his third AL MVP Award in 1932. Thanks to his strong bat, the Athletics visit to Hartford was highly anticipated. Massive crowds turned out at Bulkeley Stadium even though Connie Mack was unable to attend on both occasions in 1933 and 1935. To his credit, Mack accepted the invitations to play in Hartford and he telegraphed his lineup to the Hartford Courant in advance. On June 15, 1933, the Philadelphia Athletics had a day off and agreed a few months prior to take part in a charity game vs Hartford's best baseball club, the Gems. Most of the team, minus their Manager traveled to Hartford to beat the Savitt Gems that day by a score of 6-1. The Gems were nearly shutout by the pitching of “Big” Jim Peterson who pitched a complete 9 inning game. Foxx, the Major League home run leader at the time, was held to a mere base hit single on the day. On September 23, 1935, it was the Gems who overtook the Athletics; this time by a score of 6-4. The Gems led early and kept the lead throughout the game. On the mound for the Gems was the former Red Sox hurler Johnny Micheals who pitched the Gems to victory allowing 10 hits and 4 runs over a 9 innings of work - Michaels also gathered 3 hits of his own at the plate and scored the winning run. The Gem's brotherly duo Jigger Farrell and Tommy Farrell shined for the Gems, collecting 2 hits each in their win over the Athletics. Jimmy Foxx was held hitless on the day. It was Foxx's teammate and another AL MVP (1934) Pinky Higgins who had a good day at the plate for the "Mackmen" as they were known, going 2 for 4 on the day with a towering home run. However the Athletics batsmen would not score enough to catch up to the Gems. Starting pitcher, Bill Dietrich struggled mightily to keep the Gems from reaching base. By the 2nd inning the score was 5-0 after a barrage of hits from Jigger Farrell and a triple from Johnny Michaels. The well-attended contest ended under the lights as 27 year old Jimmy Foxx pitching the last two innings for the Philadelphia side. Since Connie Mack was absent due to an illness, Foxx also assumed the manager's role for the A's that evening in Hartford. 1933 Savitt Gems - 1st row, left to right: Johnny Miller, Manager Bill Gleason, Jackie Cronin, Mickey Noonan, Jerry Flood, and Young; 2nd row, left to right: Ray Curry, John Roser, Johnny Michaels, Coyle, Jigger Farrell, Red Munn, and Thomas Campion Sr.
Hartford Courant news clipping from June 15, 1933 on the day of the game. June 16, 1933 Hartford Courant excerpt. 1933 Hartford Courant news clipping. Hartford Courant - 1933 May 31 - The game would be rained out but a make up date was rescheduled for two weeks later at Bulkeley Stadium. An advertisement for the game published in the Hartford Courant - 1933. Hartford Courant excerpt from 1935. A Pratt & Whitney team competed in the Industrial League at Colt Park in Hartford, CT for decades.